He has his own space program. His company, by all accounts, makes wonderful electric cars. I add my own endorsement to that after a recent test-drive. He just bought a solar power company, SolarCity. I approve of solar power. His company is about to, they claim, ship the PowerWall batteries which will bring me one step closer to being able to go "off-grid." And he gets extensive coverage in the Wall Street Journal, which gives me opportunities to send them letters about his exploits. Here's my most recent. Although I'm not a big fan of government subsidies, I'm easily hypocritical enough to accept them for myself. I did so in the case of my first Prius, and got a nice tax credit when we had a solar system installed on the house in Sedona. We have more than enough capacity to run the A/C in the summer, and even some spare to charge the plug-in Prius. I've put in my order for PowerWall batteries. Presumably they will show up eventually; I've been waiting for over two years and two PowerWall versions for an actual shipping date. My goal is to put in enough batteries that can be charged during the day to power the house at night. Although this won't be adequate for going off-grid, an interesting sidelight of this arrangement is that I can combine the solar panels and batteries with a small generator to power me through overcast days and power emergencies. Elon Musk is relatively young. No batteries today, maybe no batteries tomorrow, but batteries eventually. 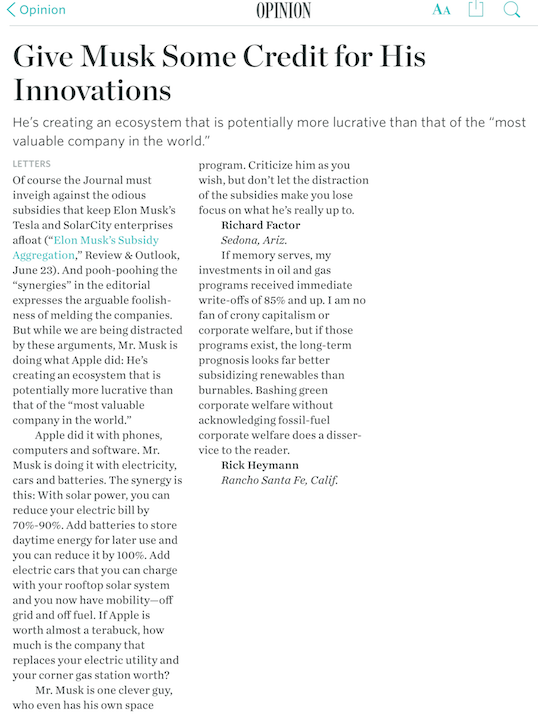 If you read my letter at left, you can sort of project the future of electric utilities here in the sunny 'burbs. I've been enjoying solar power for a couple of years now, and because I'm not shy about recommending and promoting it, I get a lot of questions from friends, neighbors, and the occasional PriUPS fan. Many of the questions are about the economics of an installation, the "payback period" that both customers and vendors seem to think is the critical parameter in determining whether to go solar. A customer will ask "How long will it take me to get my money back by saving on my utility bills"? Vendors respond with charts, graphs, and pictures with circles and arrows which purport to answer the question quantitatively with the number of years, typically between 5 and 15. The homeowner cogitates over this, and makes his decision. First, consider your cost of electricity. If you live in Hawaii or, perhaps, California, it can be very high indeed. But it's not negligible in any state. Of course, this is reflected, along with your energy usage in kilowatt-hours, in your electric bill. Next, your candidate solar vendor can supply you with the cost of your system and how many kilowatt-hours it can provide annually. This is approximately how many kWh for which you won't have to pay your utility, and is easily translated to dollars per year saved. Next, assume you have invested the cost of the system in something else, e.g., anything from a risk-free government bond or FDIC insured savings account to something wildly speculative and risky. Calculate (or guess) how much money this investment will bring in, and compare it with the amount you save on the solar system. If you save more on solar, that's most likely the better investment. If my 2nd and 3rd criteria, above, are important to you, bias your decision in their favor. Why ignore the payback period? Because, to a first approximation, the money you "invest" in the solar system, like many home improvements, will come back to you when you sell the house. It's almost irrelevant! I feel that this is a much more logical way to consider going solar than the payback period model. There are any number of additional considerations that you should at least think about. For example, you probably pay your electric bill with after-tax income, but the IRS doesn't (yet) tax sunlight. You may be able to change your utility "plan" to take advantage of higher daytime rates that you won't pay along with lower nighttime rates that you will. You don't necessarily get 100% of home improvements back when you sell. You can't predict future electric rates, which are a significant factor in your decision. How much lower will the price of solar power go if you wait another year or two? Will the government continue to offer subsidies? And so forth. Your decision might well be different from mine. I'm very happy with my solar system. So far it's been trouble free, and I love those tiny summer bills! And I'm still waiting for Elon Musk to conquer the world. 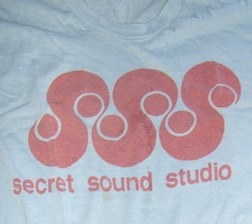 Secret Sound Studio in New York City was run by Moogy Klingman and owned by Todd Rundgren, who sang at the Tec Awards banquet a couple of years ago. Until then I hadn't seen him perform since the '70s. In doing my "research" for this TotD, I discovered that I won't be seeing Moogy again. He died in 2011 at age 61.